"On the first day of Christmas my true love gave to me…" beautifully decorated trees with your classically designed Holiday Splendor Party Supplies Pack, complete with decorations and party tableware for you and seven guests! 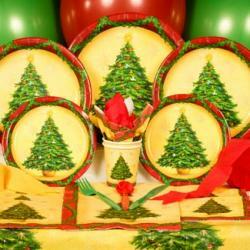 Discount Party Supplies is a leading online retailer of party supplies, birthday supplies, and other party products. I came across their site and was lucky to have the opportunity to review a great party-Holiday Splendor Standard Party Pack. I reviewed as well, a small kaleidoscope . It did not have a dial on the front to turn but it's great for a little one to use. Would fit into a little one's hands easy and just by moving it around they could see all sorts of pretty patterns. It brought back memories as I hadn't used a kaleidoscope since my kids were small, but my niece that's 3 loves it! Also the Whimsical Snowman Hanging Decorations I reviewed will be nice to hang around the house once we start decorating in a few weeks. All this for only $18.99. Besides the holiday parties, think ahead to New Years Eve parties as well. Discount Party Supplies would love to give away a $25 gift certificate to one lucky winner in the USA to help to buy their own party pack for any holiday or occassion they wish.A random draw will be made by Random.org on November 29, 2011 from all entries received. Tell me what party pack you would get if you win. For a birthday, Christmas, New Years? I would get supplies for my daughter's 1st birthday. I'd get New Year's for sure...thanks for the giveaway!